On April 16, 1867, aviator and inventor Wilbur Wright was born near Millville, Indiana, to Milton Wright and Susan Koerner. He was the third of seven children born to the Wrights, five of whom survived infancy. The brothers Wilbur and Orville Wright have had multiple appearances on A Stamp A Day, the first being August 19, 2016, in an article about National Aviation Day which also happens to be the anniversary of Orville Wright’s birth. The Wright Brothers’ first successful flight near Kitty Hawk, North Carolina, on December 17, 1903, was marked by ASAD articles in both 2016 and 2017, while Wilbur’s life was highlighted in a stamp issuer profile on the Republic of the Congo. 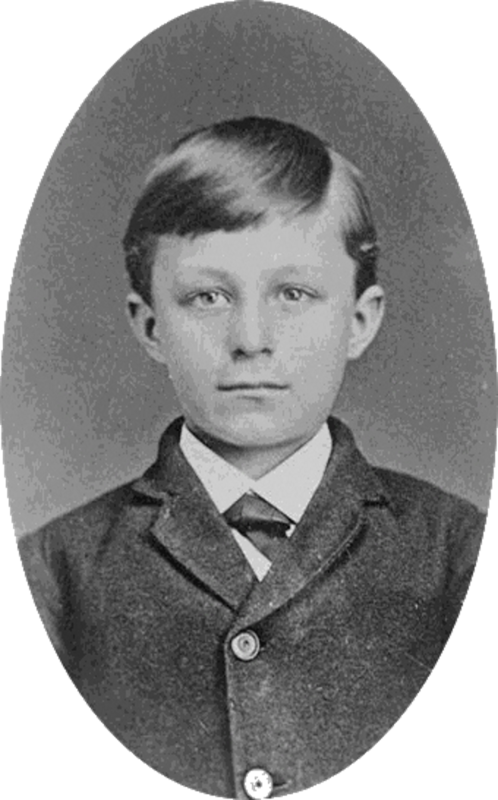 Portrait of Wilbur Wright aged 10, circa 1877. Wilbur moved often as a child due to his father’s ministry in the Church of the United Brethren in Christ, and he attended primary schools in Iowa and Indiana. He attended high school in Richmond, Indiana, but did not receive his diploma with the rest of the class of 1884 as his family moved to Dayton, Ohio, before his commencement ceremonies. In Dayton, Wilbur enrolled in the college preparatory program at Central High School, but a freak hockey injury during the winter of 1885-1886 caused him to convalesce at home for three years. During those years he nursed his ill mother, who died of tuberculosis in 1889, and read widely in his father’s extensive library. In 1889, Wilbur and brother Orville — four years his junior — decided to form a business partnership and open a printing shop. Between May of 1889 to August of 1890, they published two local newspapers, the West Side News and the Evening Item. The newspapers failed in a saturated journalistic market, but their printing shop fared better. In 1890, they moved it to new quarters in the recently-built Hoover Block on West Third Street near the Wright family home. It was there that the Wrights printed the Dayton Tattler, a short-lived newspaper for the local African American community that was edited by a high school acquaintance of Orville’s, Paul Laurence Dunbar. Dunbar later gained national renown for his poetry. Milton piqued the interests of Wilbur and Orville in aviation in 1878, when he gave them a toy helicopter after one of his trips in the west. The 1896 death of German aviation pioneer Otto Lilienthal in a glider crash, rekindled the brothers’ latent interests in flying. Drawing upon similarities between bicycling and flying, Wilbur and Orville began researching aerodynamics, propulsion, and control. Their research did not occur in a vacuum; they investigated the experiments of other aviation pioneers, writing to the Smithsonian Institution in Washington, D.C., for suggestions of relevant readings in 1899. First successful flight of the Wright Flyer, by the Wright brothers. The machine traveled 120 ft (36.6 m) in 12 seconds at 10:35 a.m. at Kill Devil Hills, North Carolina. 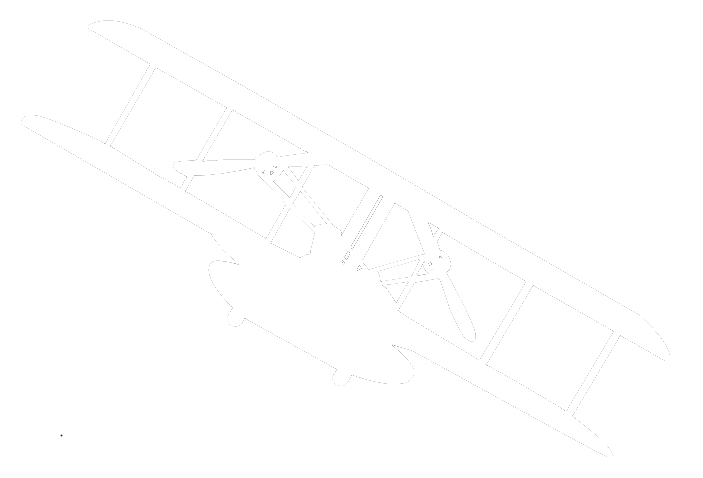 Orville Wright was at the controls of the machine, lying prone on the lower wing with his hips in the cradle which operated the wing-warping mechanism. Wilbur Wright ran alongside to balance the machine, and just released his hold on the forward upright of the right wing in the photo. The starting rail, the wing-rest, a coil box, and other items needed for flight preparation are visible behind the machine. This is described as “the first sustained and controlled heavier-than-air, powered flight” by the Fédération Aéronautique Internationale, but is not listed by the FAI as an official record. The Wrights progressed from kite to glider research and, valuing privacy while needing consistently high winds, moved glider experimentation to the sand dunes of Kitty Hawk, North Carolina. Research and development activities took place at the cycle shop on West Third Street in Dayton. 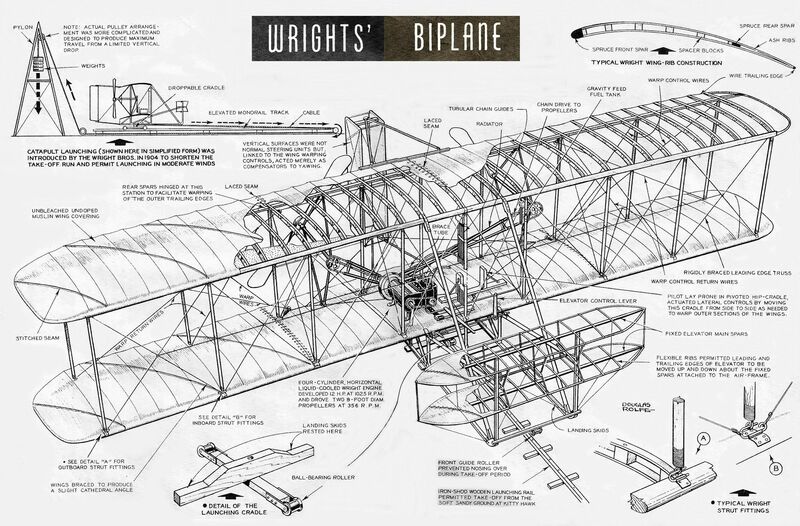 Through experimentation at the cycle shop using a small, homemade wind tunnel, the Wrights designed the airplane that made the first free, controlled, sustained flights on December 17, 1903, in a power-driven, heavier-than-air machine. 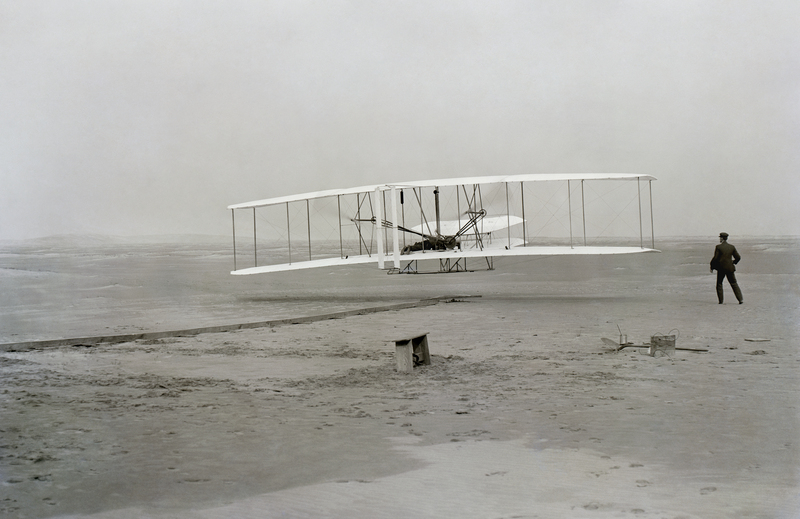 The first flight was piloted by Orville Wright at 10:35 a.m., the plane stayed twelve seconds in the air and flew 120 feet. Wilbur Wright piloted the longest flight that day in the fourth test, fifty-nine seconds in the air and 852 feet. Experimentation and flight testing over the next decade at Huffman Prairie, eight miles (13 km) east of Dayton, and at Kitty HawJk, resulted in the development of practical airplanes that could remain airborne for as long as fuel reserves permitted. 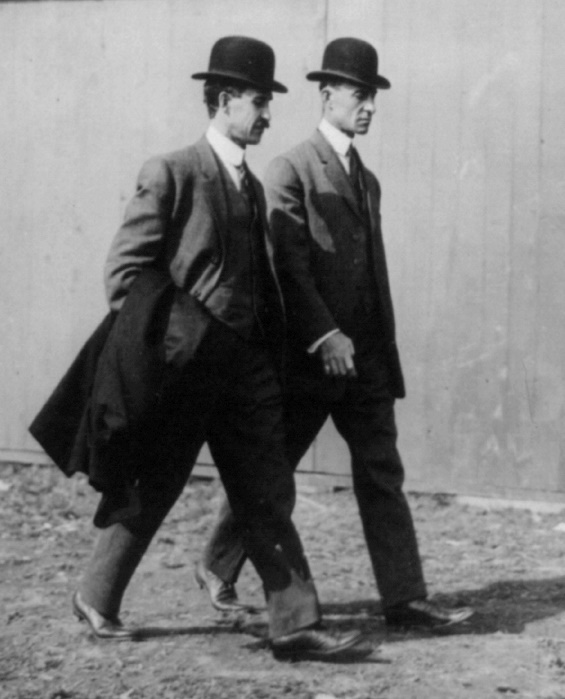 The Wright brothers at the International Aviation Tournament, Belmont Park, Long Island, N.Y., October 1910. 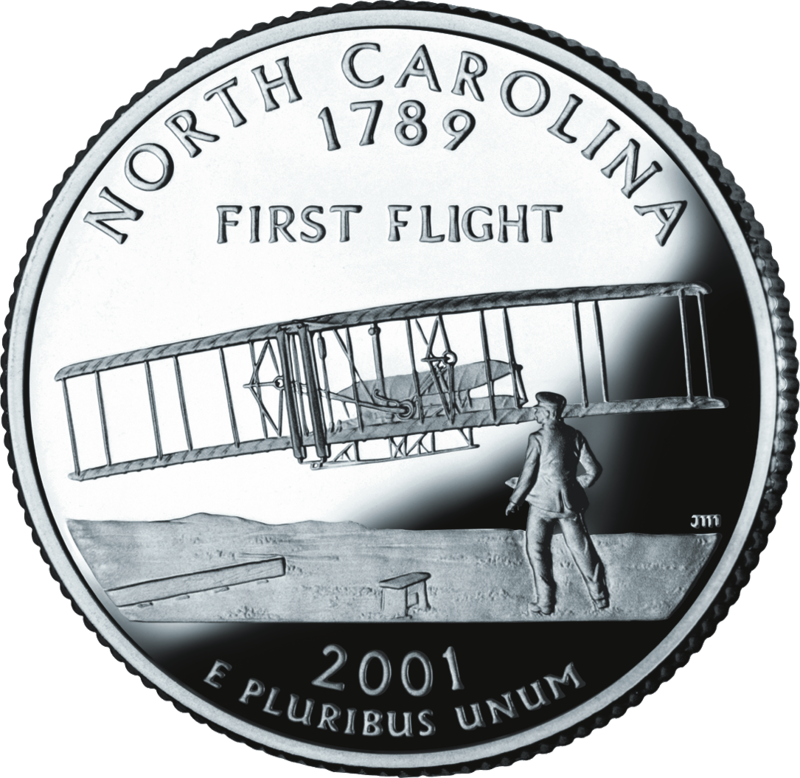 United States quarter (25 cents) issued for North Carolina, 2001. The first U.S. stamp to commemorate the Wright Brothers and their 1903 first flight was a 6-cent air mail stamp released on December 17, 1949 (Scott #C45). Since then, hundreds of stamps from dozens of stamp-issuing entities have issued stamps to honor these pioneers of aviation. The theme is probably the second most popular subset under the collecting topical of aviation (after that of Charles Lindbergh and his Spirit of St. Louis). 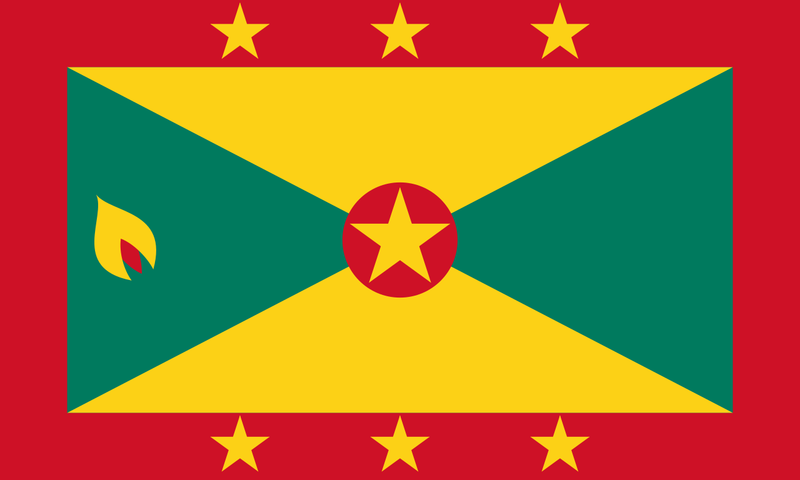 Since attaining independence in 1974, the Caribbean island nation of Grenada has released numerous topically-themed stamps aimed primarily at the collector market rather than for actual mail usage. Disney characters feature on a number of these and the majority of those under the theme of aviation seem to feature zeppelins more than anything else. 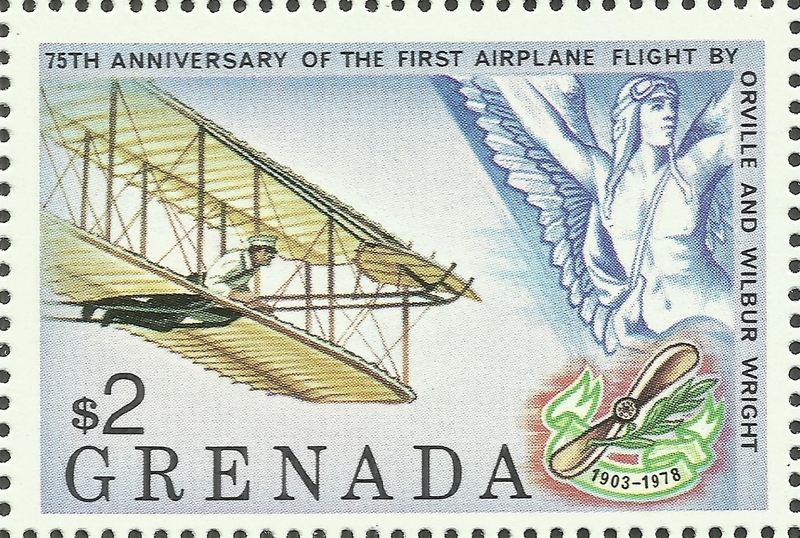 On February 13, 1978, Grenada released seven stamps and a souvenir sheet containing two stamps to commemorate “aviation history”, ignoring the Wright Brothers completely. Wilbur and Orville’s commemoration was to arrive later that year. 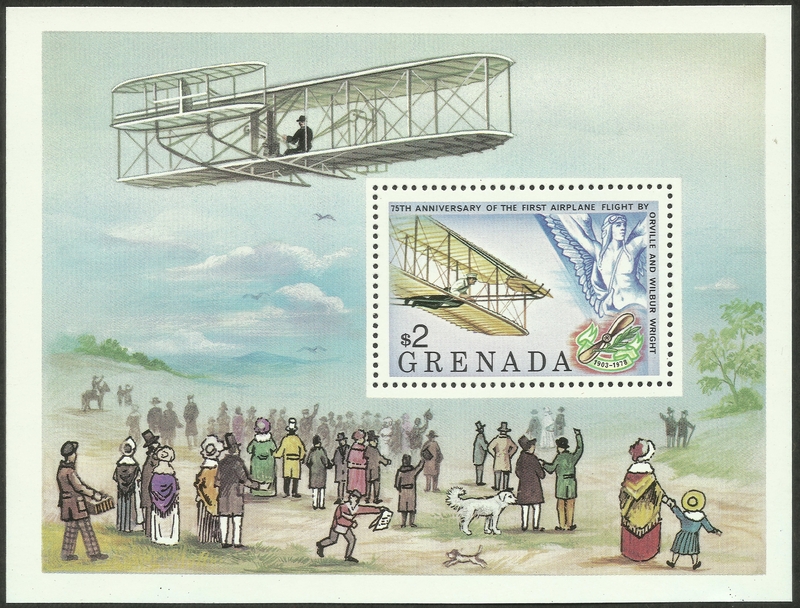 The 75th anniversary of the first powered flight of the Wright Flyer was marked by Grenada’s issuance of a seven-stamp and one souvenir sheet set released on August 24, 1978, all printed by lithography and perforated 14. They were designed by Hungarian Gyula László Vásárhelyi who designed 7500 stamps for 165 different countries. The souvenir sheet had a denomination of two dollars and the stamp contained within featured the Flyer as well as an allegory of flight.